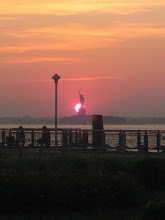 Red Hook Economic Development (R.E.D.) is a new group put together by many Red Hook businesses. They are already getting some things done, having created the "Red Friday" promotion that happened the day after Thanksgiving (post here), and I believe they've had a hand in helping Red Hook stores to get into the holiday spirit with lights and decorations in their windows, etc. as well as the RED HOOK lights on Van Brunt Street at Hamilton Avenue. 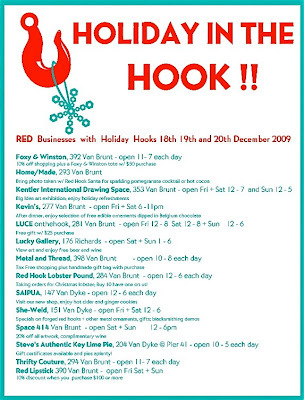 In that vein, RED has come up with "Holiday in the Hook", with many stores offering discounts or special offers. Come out to RED's upcoming Holiday in the Hook! Discounts? Yes. But also blacksmithing demos, cute animal themed cards, and plenty of holiday drinks and treats! Fun for all, right in your own back yard. There are many offers and discounts to be had - here's what's listed on the above flier and on RED's "Holiday in the Hook" Facebook page. Taking orders for Christmas lobster; Buy 10 have one on us! Gift certificates available and pies aplenty! 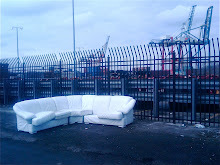 Happy New Year (and bus route), Red Hook! Let it Salt, Let it Salt, Let it Salt.